While most soccer fans have been riveted on the World Cup in South Africa this month, some English Premier League stars are focusing their attention on the homeless in this country. 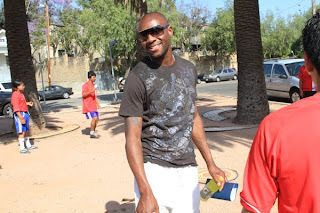 First International Ambassador of Street Soccer USA Emmerson Boyce of Wigan Athletic, Liverpool’s David N’gog, Ibrahima Sonko of Stocke City FC and Aaron Brown of Leyton Orient FC were in Los Angeles recently to play a friendly match with members of the Jovenes, Inc. Street Soccer team. The stop at Boyle Heights-based Jovenes, Inc., a nonprofit organization designed to help homeless youth in the downtown, East L.A. and Northeast areas of the city integrate back into society, was the beginning of an 18-city U.S. tour to combat the issue of homelessness. “I am thrilled to join Street Soccer USA as an International Ambassador,” Boyce, who helped bring the other players here, said. “As someone who believes in team sports and the positive community that surrounds them, I believe in my heart the mission of SSUSA. One of the tools for combating homelessness is Street Soccer USA, a more compact version of the traditional game that is played four to a side on a basketball-size court. The Jovenes (Spanish for “youth”) team and English pros played their match on the basketball court at Pecan Playground in Boyle Heights. Street Soccer USA teams are organized at homeless shelters, employment programs and recovery houses to help teens and adults with education, housing and jobs. The teams train twice a week, compete in local leagues and tournaments, then meet annually at the 18-city SSUSA Cup in Washington, D.C. from July 30-Aug. 1. Players are also competing for a spot on the Street Soccer USA national team that will travel to the Homeless World Cup in Rio de Janeiro, Brazil in September. Johnny Figueroa, coach of the Jovenes team, was appreciative of Boyce and the others traveling this far to lend their support to the local organization and others like it. “These Premier League stars don’t have to do this, but people should take notice of what they are doing for the homeless and impoverished,” National Program Coordinator and West Coast SSUSA Director Rob Cann said in a statement. Paulo Vazquez, 22, one of the Jovenes players, has been in the local shelter for five months and is appreciative of the help it has provided him. For more information on the organization, visit streetsoccerusa.org. Street Soccer Seattle's First Game Tomorrow! The Count Down Begins- Only 7 Weeks to go! Street Soccer Sacramento Receives Award!